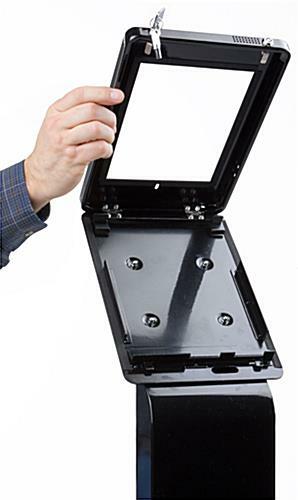 This Apple® tablet holder, ipad mini kiosk that is rust resistant and moisture-proof, is designed for daily use in high traffic environments. 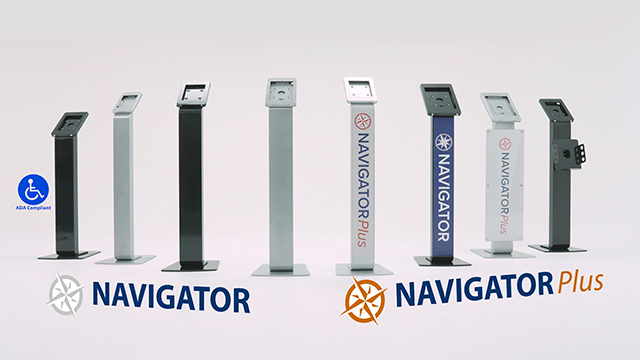 Each electronic device display is a great way to interact with patrons and communicate valuable information between the consumer and proprietor. 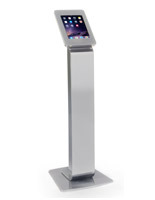 Place an iPad mini kiosk that can help to collect important data from customers anywhere indoors to instantly engage passersby and potential clientele. 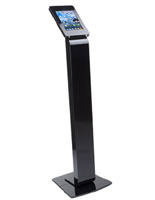 This Apple® tablet floor stand is frequently found being used in schools, shopping malls, auto dealerships, museums, trade shows, restaurants, and other commercial locations. 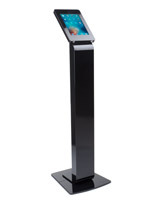 An Apple® tablet mount, iPad mini kiosk that allows a business to communicate relevant information to patrons is a great way to get the word out about upcoming events, new sales and promotions. Each Apple® electronics enclosure allows access to the front camera hole as well as to the volume controls. This iPad mini kiosk is a great way to relay information to patrons while collecting valuable statistics pertaining to current trends. 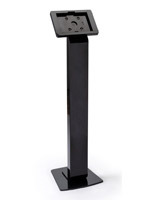 Each electronics floor stand has a durable black powder coated finish that provides an attractive appearance for the unit as well the ability to sustain years of daily wear and tear. 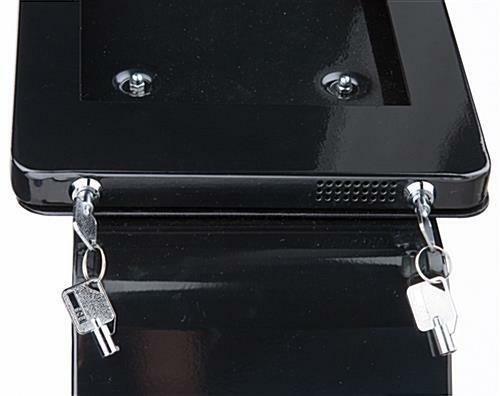 Each iPad mini kiosk with dual locks to secure the tablet includes (2) sets of keys and a covered home button to prevent unwanted tampering. Each electronic device holder also features a locking compartment to conceal an internal power strip for supplying consistent power to the Apple® product through a hidden charging port. 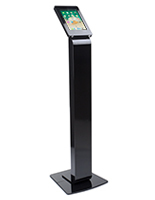 The iPad mini kiosk, called a tablet mount, is a great tool for businesses looking to keep expensive marketing displays such as mobile Wi-Fi equipment protected while on display. This device mount for Apple® products is constructed from high quality aluminum ensuring this unit will outlast those of competitors. 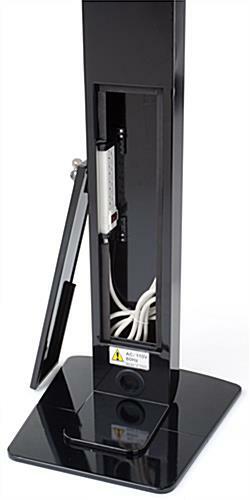 An iPad mini kiosk provides security and functionality. 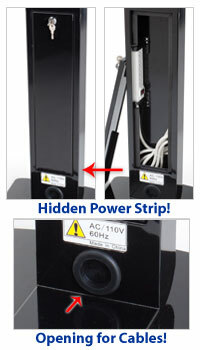 Be sure to browse this website for a large selection of tablet enclosures and stands. 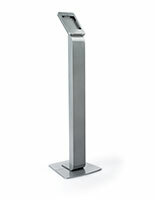 Purchase an iPad mini kiosk for commercial establishments today! Please Note: Cord management will not be accessible when in landscape orientation. 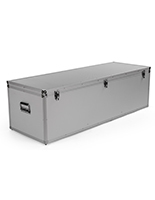 14.8" x 53.0" x 14.8"
14.8" x 0.5" x 14.8"